Issue 73 Giant Toys story. 9.00 EACH Back Issues of Playset Magazine Issue 64 Super Circus. 5.00 Sheet of paper flags, 1/32 in scale, but I might be able to make 1/72 examples. Sheets 1-7 are double sided that you glue, Sheet 8 you will have to cut out and match up (no guarantees). Plus the tips the Man (John Boyle I think) had for cutting and gluing. 22.50 32016 WWII German Naval Troops; 15 Figures in 8 poses, bluegray in color. 22.50 32017 WWII German Luftwaffe Field Division; 15 Figures in 8 poses, bluegray in color. 22.50 32020 Caribbean Pirates; 15 Figures in 8 poses, brown in color. 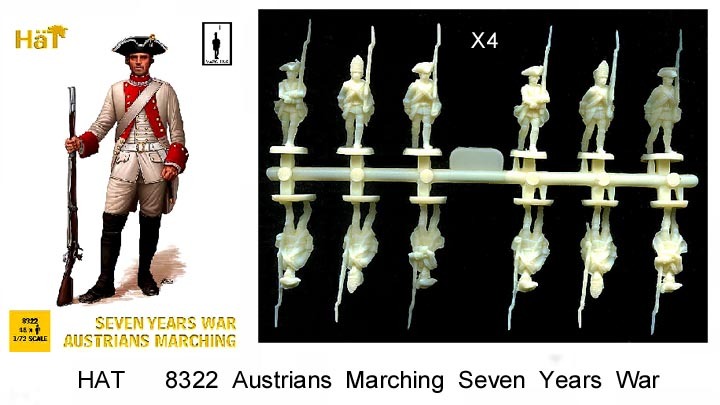 12.00 8322 Austrian Marching, 7 Years War; 48 Figures in 3 poses. Made in a cream color. 12.00 8323 Austrian Action, 7 Years War; 48 Figures in 7 poses. Made in a cream color. 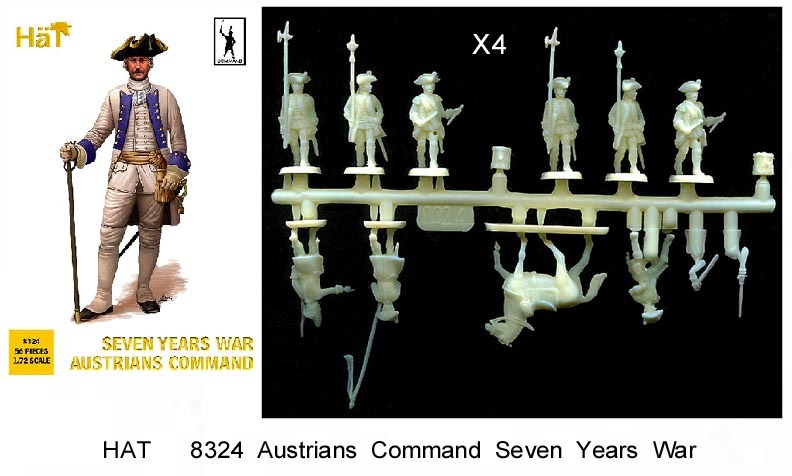 12.00 8324 Austrian Command, 7 Years War; 36 Figures in 6 poses + 4 horses in 1 pose. Made in a cream color. 11.00 8295 Austrian Sampler, 7 Years War; 33 Figures in 16 poses + 1 horse. One sprue each of 8322, 8323 & 8324. Made in a cream color. 11.00 8329 Prussian Sampler, Napoleonic Wars; 29 Figures in 21 poses. One sprue each of 8253, 8254 & 8255. Made in a blue color. 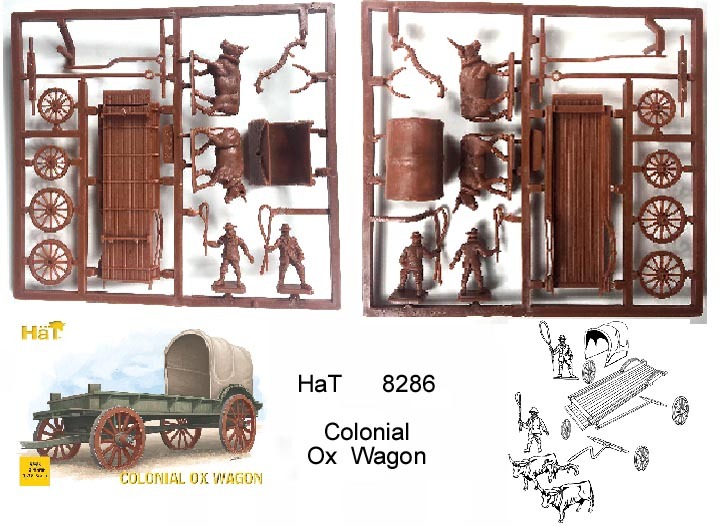 15.00 Hat 8286 Colonial Ox Wagon; 3 Wagons, made in brown. 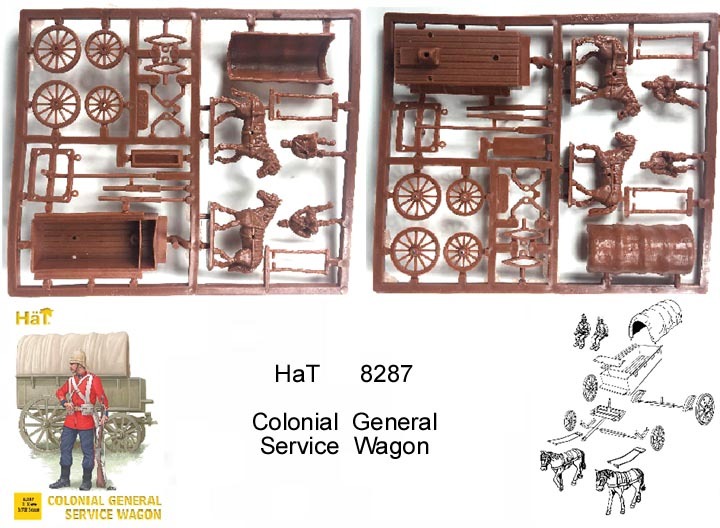 15.00 Hat 8287 Colonial General Service Wagon; 3 Wagons made in brown. 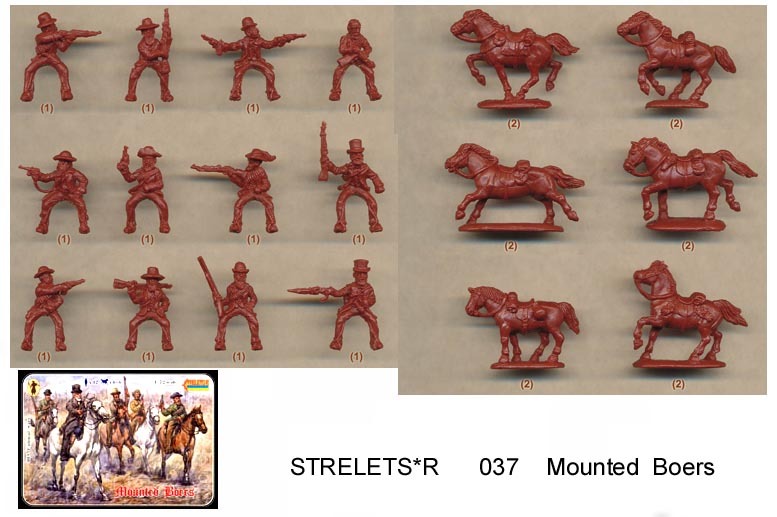 13.00 Strelets 037 Mounted Boers, REISSUE; 12 Figures in 12 poses + 12 Horses in 6 poses. Made in redbrown. Picture courtesy Plastic Soldier Review. 13.00 Strelets 168 Landwehr on the March; 44 Figures in 18 poses. Made in gray. Picture courtesy Plastic Soldier Review. 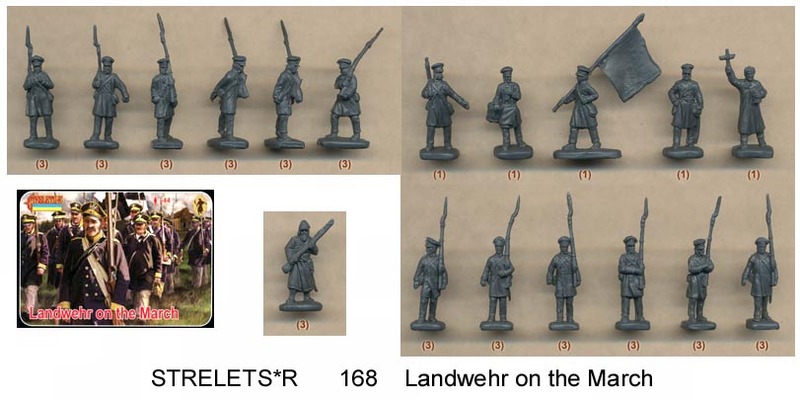 13.00 Strelets 169 Landwehr Standing at Ease; 47 Figures in 19 poses. Made in gray. Picture courtesy Plastic Soldier Review. 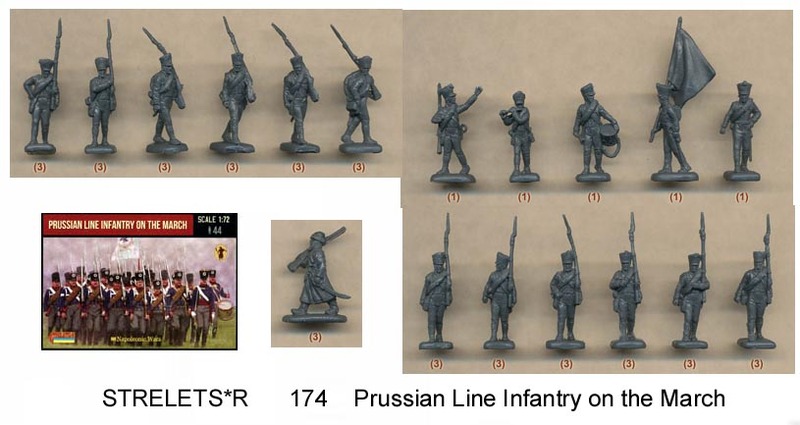 13.00 Strelets 174 Prussian Line Infantry on the March; 44 Figures in 18 poses. Made in gray. Picture courtesy Plastic Soldier Review. 13.00 Strelets 176 Japanese Type 38 75mm Field Gun; 21 Figures in 7 poses + 3 cannons. Made in tan. Picture courtesy Plastic Soldier Review. 13.00 Strelets 177 British 15 pdr 7 cwt BL Gun; 21 Figures in 7 poses + 3 cannons. Made in light tan. Picture courtesy Plastic Soldier Review. 13.00 Strelets 182 30 pdr Parrott Rifle with US Crew; 21 Figures in 7 poses + 3 cannons. Made in blue. Picture courtesy Plastic Soldier Review. 13.00 Strelets 183 Japanese Type 38 75mm Field Gun; 21 Figures in 7 poses + 3 cannons. Made in tan. Picture courtesy Plastic Soldier Review. 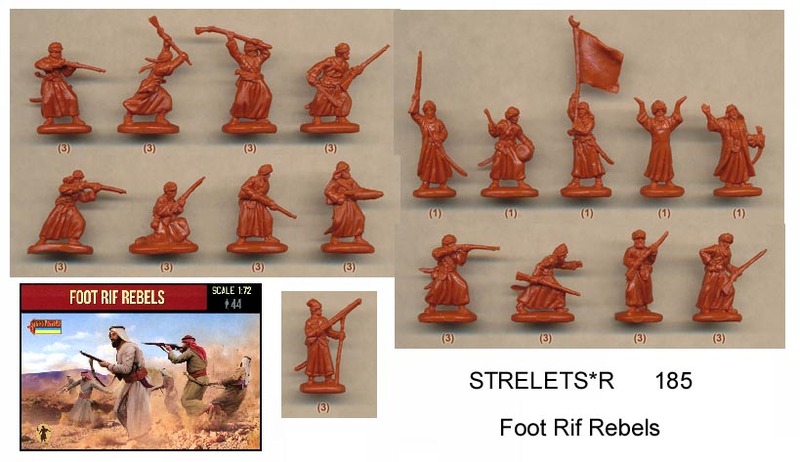 13.00 Strelets 185 Foot Rif Rebels; 44 Figures in 18 poses. Made in redbrown. Picture courtesy Plastic Soldier Review. 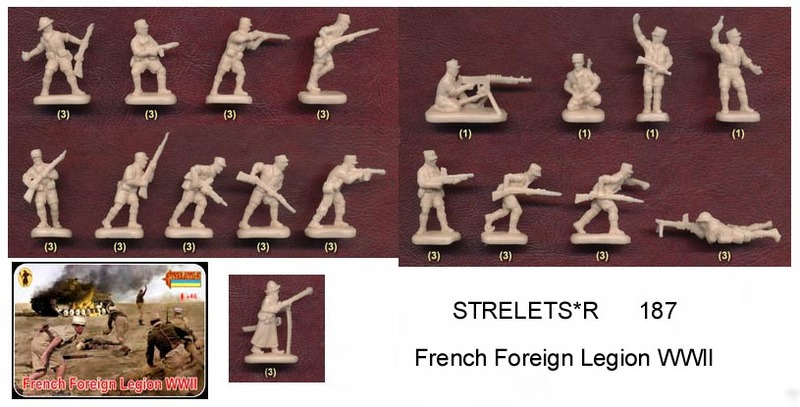 OUT OF STOCK - Strelets 186 French Foreign Legion Early XXC; 46 Figures in 18 poses. Made in light blue. Picture courtesy Plastic Soldier Review. 13.00 Strelets 187 French Foreign Legion WWII; 46 Figures in 18 poses. Made in cream. Picture courtesy Plastic Soldier Review. 13.00 Strelets M054 Bashi-Bazouks; 52 Figures in 13 poses. Made in light blue. Picture courtesy Plastic Soldier Review. 13.00 Strelets M077 Spartacus; 21 Figures in 7 poses + 3 cannons. Made in gray. Picture courtesy Plastic Soldier Review. 18.00 Strelets A014 Creusot Long Tom 155mm with Boer Crew; 10 Figures in 10 poses + 1 cannons. Figures made in redbrown. Cannon is hard plastic and glue will be needed for assembly. Picture courtesy Plastic Soldier Review. 8147 Nassau Infantry in green, 8179 Gatling gun in blue, 8186 British Peninsular Infantry in red, 8198 Austrian Grenadiers, 8199 German Jaeger, 8200 German Infantry, 8204 Austrian Grenzer, 8210 Colonial Artillery in blue, 8233 Austrian Landwehr, + 8004, 8018, 8039, 8059, 8067, 8081, 8083, 8096, 8226, 8130, 8157, 8189, 8292, 8293. 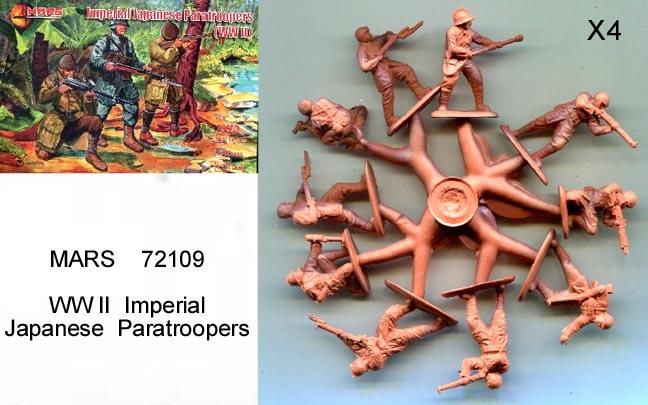 12.00 Mars 72109 WWII Imperial Japanese Paratroopers; 40 Figures in 8 poses (4 sprues). Made in a rust color. 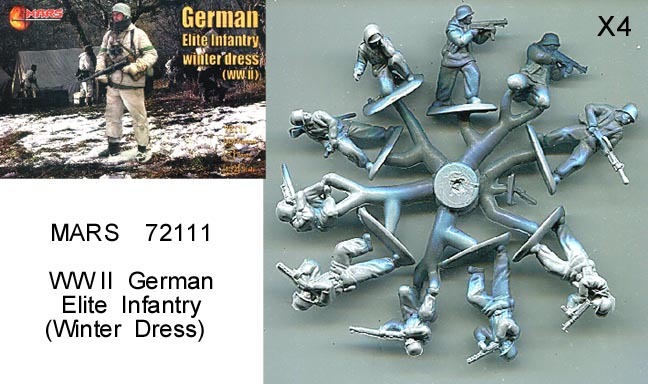 12.00 Mars 72111 WWII German Elite Infantry; 40 Figures in 8 poses (4 sprues). Made in a gray color. 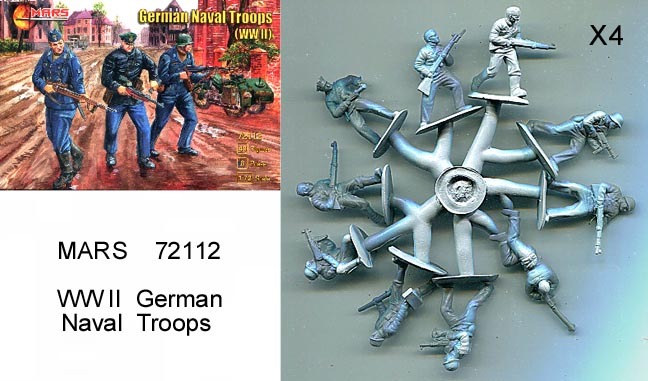 12.00 Mars 72112 WWII German Naval Troops; 40 Figures in 8 poses (4 sprues). Made in a gray color. 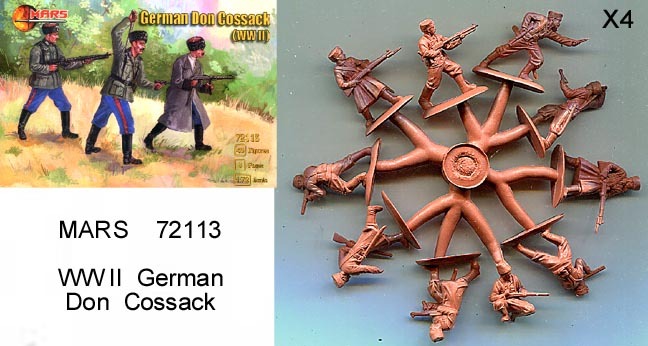 12.00 Mars 72113 WWII German Don Cossack; 40 Figures in 8 poses (4 sprues). Made in a rust color. Small 1/72 scale gray copies with factory paint of Marx 45mm Space Patrol figures were made in the 1950s/60s and were sold on blister cards and perhaps in "gum ball" machines. 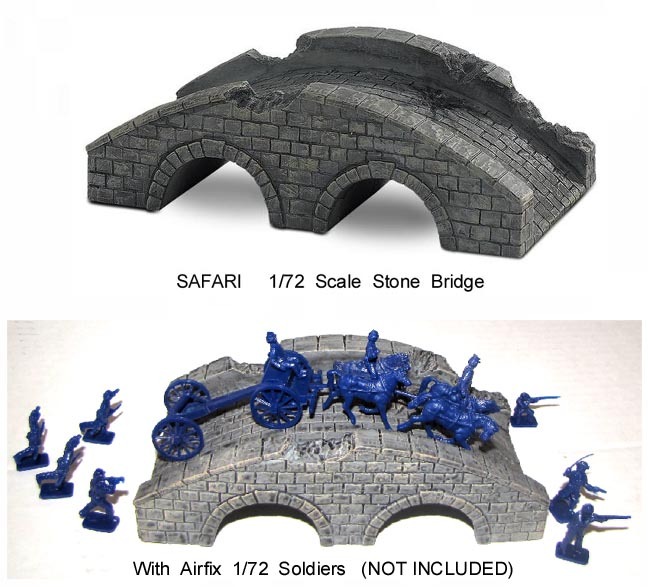 These figures can also be found in a variety of unpainted colors. 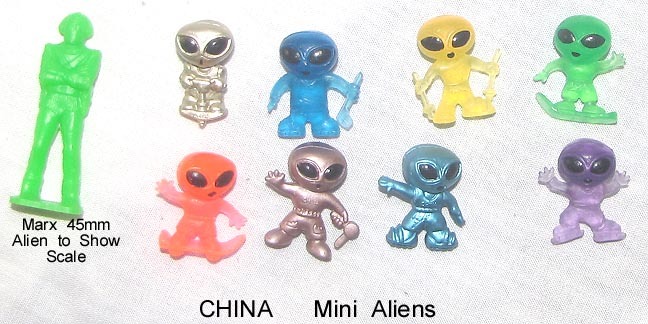 10.00 20 Mini aliens in 8 poses. About one inch tall. Made in China. 10.00 20 Mini robots in 3 poses. About one inch tall. Made in China. 25.00 32015 WWII Japanese Infantry, 15 Figures in 8 poses. 35.00 All six REISSUE/RECAST movie monsters; 3 blue, 1 green. 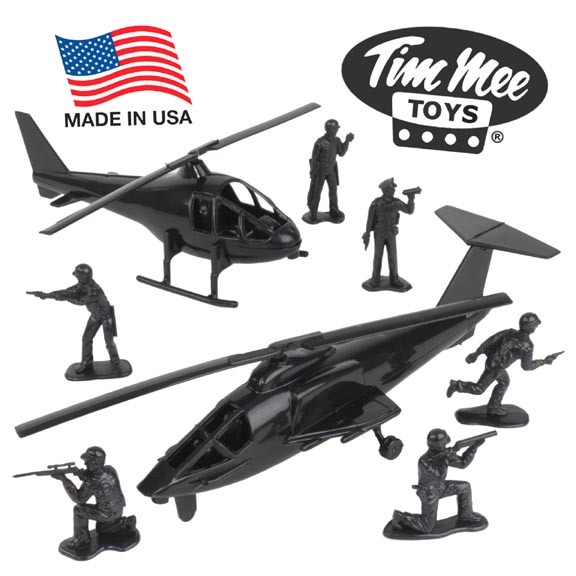 - 18.00 J.Lloyd International Tim-Mee "Black OPs" header card bag with two PPCo Helicopters and the six man S.W.A.T. team all in black, A cool set Made in the USA. My name is Kent Sprecher. I am the owner of Toy Soldier HQ Inc. My goal is to bring you quality products at reasonable prices. We want you to be happy period.